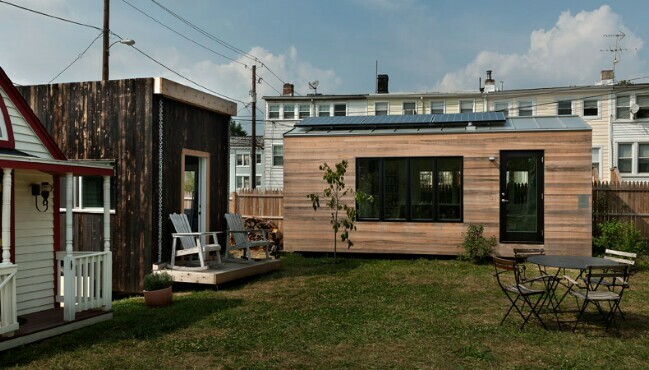 There are a lot of beautiful tiny houses out there, but not all that many have won numerous awards and been featured so widely as the Minim House. The Minim House was commissioned in 2013 by Brian Levy, who worked with Foundry Architects to design it. After the home won a series of awards and appeared in a number of publications, people became interested in owning one like it. Since then, around 60 sets of house plans have shipped to customers all around the world. A few finished homes have also been delivered to buyers. When I heard this story, I wondered what all the hype was all about. So I had to take a look at the Minim House. And when I saw it … I had to share it with you! Above you see exterior side shots of the Minim House. The siding is untreated, shiplapped cypress. You can see that the wood here is brown but shows some gray; over time, the gray color will become more prominent as the wood ages. The construction and materials of the home were inspired by the Pope-Leighey House in Virginia, which was designed by Frank Lloyd Wright. The Pope-Leighey House is a great example of a tiny house constructed way back before we had a name for it (the 1940s). In this photo, the bed has been pulled out. 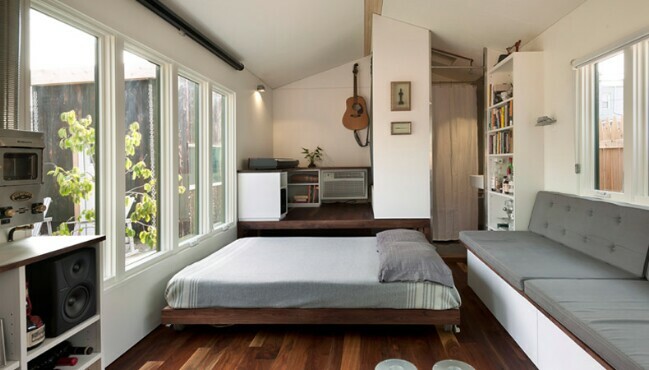 It is in a great spot to take advantage of natural light—perfect for relaxing or reading a book. When you want to get it out of the way again, you just push it back under. With this shot, we are facing the other direction, looking toward the kitchen. 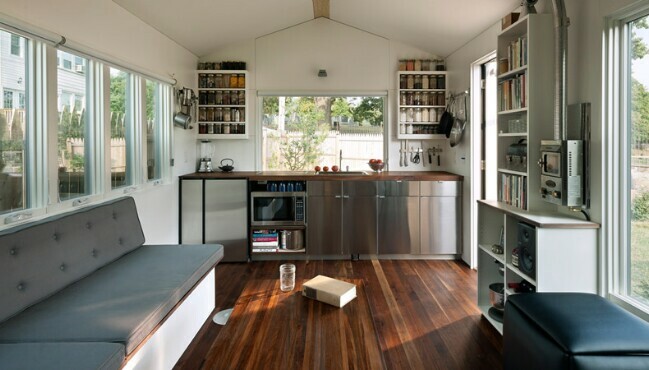 The design of the Minim House differs from many other tiny houses in that the kitchen is set against the back wall—rather than one (or both) of the side walls. 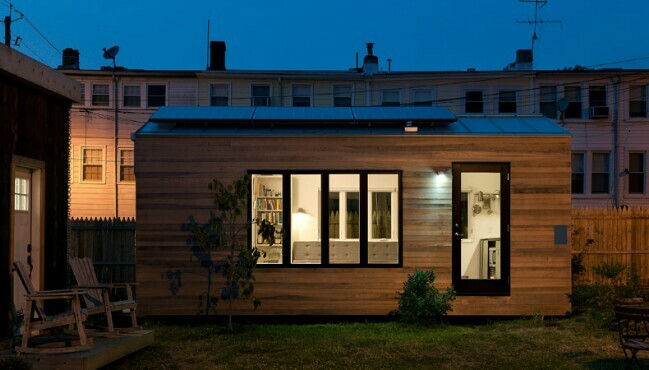 The Minim House is quite a bit wider than many other tiny houses, which is why this design works so well. 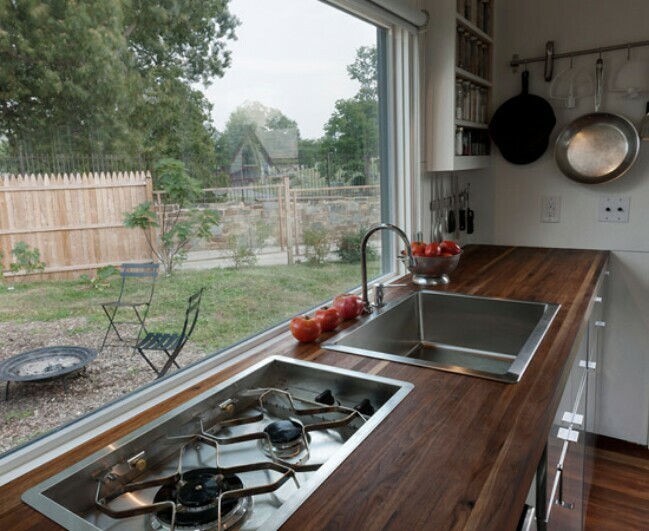 Notice the big window in back as well—more natural light for cooking. 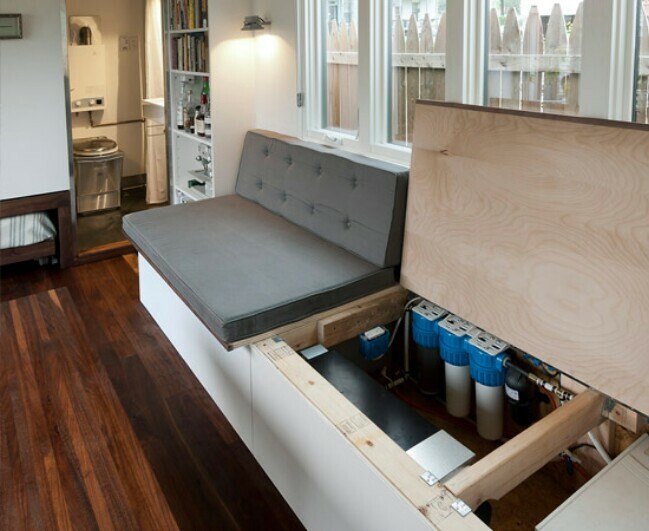 A water filter water tank and extra storage are concealed beneath the couch, which is wide enough to double as a guest bed. Here is a closer look at the kitchen and the view out the window over the sink. 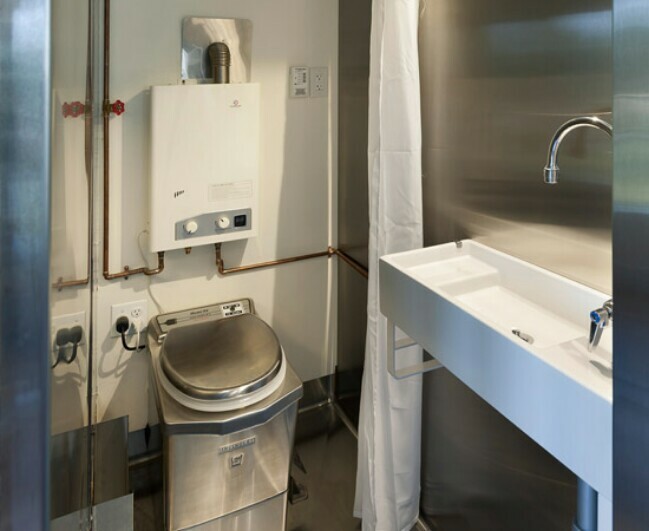 The bathroom features a lot of stainless steel for a clean, modern look. Okay, it reminds me a lot of a bathroom on a train, but this is not necessarily a bad thing. At least it is a little roomier. Finally, here is one more photo of the exterior of the house, giving you more perspective on its size. 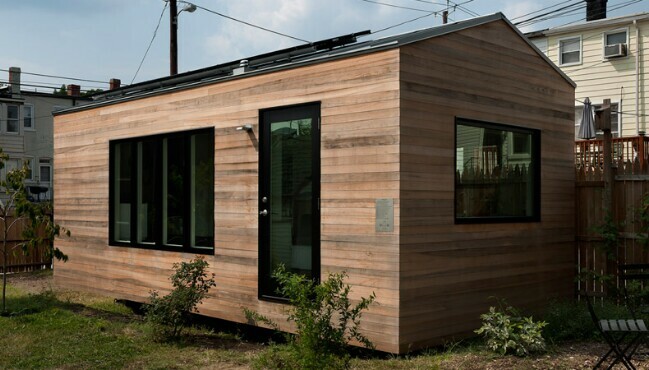 Fancy a Minim House of your own? You can visit the link below to find out more about the Minim House at its official website. There you can order plans or a finished structure—it’s up to you. 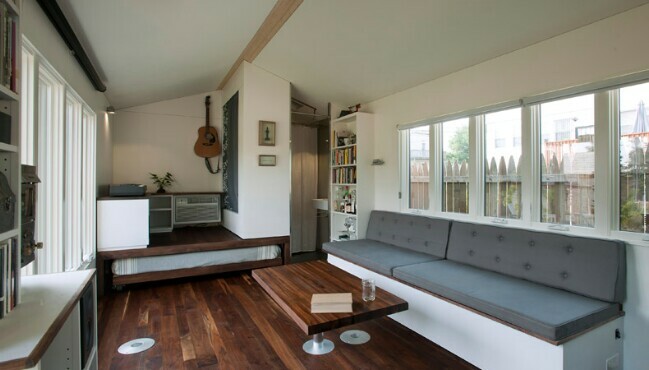 Or you can just browse more photos of this beautiful dwelling for inspiration for your own tiny house design! 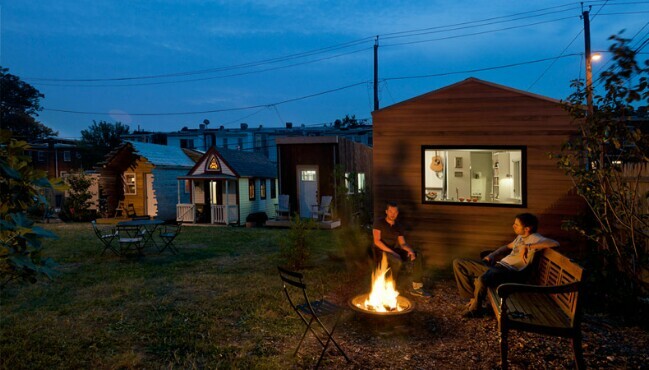 I would love to have a tiny house community on my family land!! We have plenty of land and love to build a pond and camp sight and still have room for tiny houses!!! It is a dream but it would be awesome to do it!